Each Solaire grill has a "rocket under the hood" - the Solaire Infrared Burner. This superior burner gives you the high heat necessary to lock in the juices for more tasty, flavorful food than you can ever get from a conventional barbecue grill. The finest steakhouses use infrared - and now you can too with a Solaire Infrared. As an added bonus, Solaire Infrared Grills preheat in only 3 minutes, and cook about twice as fast as more traditional units. You'll be finishing dessert before the neighbors even start to eat (unless they have a Solaire too!). With this speed, you can make grilling an everyday occurrence rather than just a weekend event. • Less than 20 lbs. with carry bag (truly portable!). • Great for RVers and Tailgaters - heats up fast (less than three minutes), cools down fast (pack away in about 15 minutes) and no coals to dispose of. • Uses 1 lb. propane bottles or 20 lb. tank with optional adaptor. Can also be converted to use natural gas. • Great introduction to the benefits of Solaire Infrared - try before you buy one of our larger patio models (27", 30" 42" and 56" sizes). "Twice the Flavor in Half the Time" isn't just a catch-phrase, it's a fact with Solaire infrared technology. 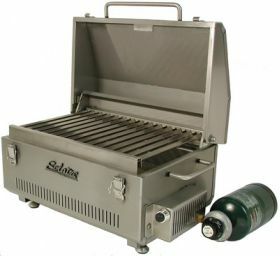 These grills will produce food to rival anything you've ever tasted, in a fraction of the time you're used to spending. • More Flavorful Food - Intense direct heat enhances natural flavor for succulence and taste that rival the finest steakhouses. • More Efficient - Solaire infrared burners are ready to grill in just 3 minutes and cook twice as fast as traditional burners. • More Convenient - With shorter grilling times, grilling can become part of your everyday lifestyle, not just a weekend event. And since infrared heats food directly, not the air around it, grilling year-round, even in frigid weather, is no problem. • Fewer Flare-ups - Because there is no secondary heat element to trap grease, flare-ups are virtually eliminated. Drippings instantly vaporize, adding a great natural flavor to your food. • Versatile - Grill anything like a pro, from steaks to seafood, chops and vegetables. • Charcoal-like Grilling with no Hassle - Get the great flavor of an intensely-hot charcoal fire with the control, convenience and consistency of gas.